TidyTabs is also available as a portable version that you can carry and execute from a USB flash drive without any installation involved. Here is how to use it. ZIP files can be extracted with a program such as 7-Zip. Activate TidyTabs Professional Edition: you will be prompted to enter your license key in order unlock the features of the Professional Edition. Begin a Trial: this will unlock the features of the Professional Edition for a limited time. At the end of the trial period, you will continue with the Personal Edition. 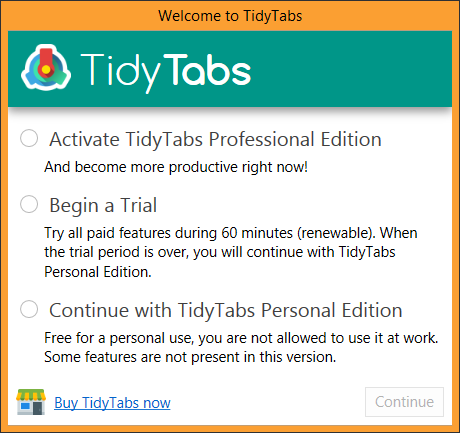 Continue with TidyTabs Personal Edition: this will allow to use TidyTabs for free for a personal use, some advanced features will be disabled. TidyTabs is now running, a small Icon should appear in the Windows System Tray, at the bottom right corner of the screen. 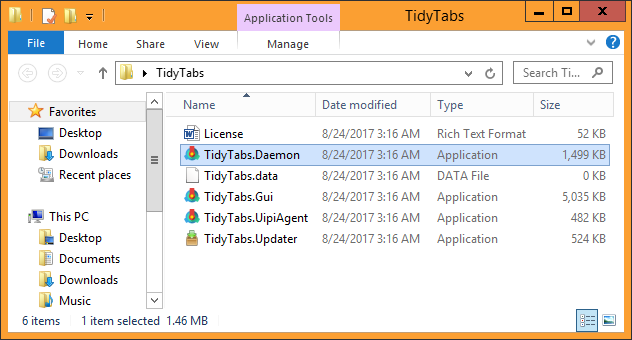 By default, TidyTabs will not automatically start with Windows, but this can be configured in the TidyTabs settings. There are several exe files in the TidyTabs directory, which one should I use?